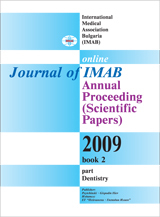 The purpose of this study is to carry out comparative in vitro study of bactericidal effect of antimicrobial drugs used in modern endodontics against some basic microbial agents of periodontitis. Using the agar diffusion method (experiment with sterilized disks and wells) antimicrobial effect of five antimicrobial agents used in endodontics is evaluated: Rockle, Cresophene, I2/KI, Cupral, Ca(OH)2- high dispersion. For the study three types of nutritious media are used: BHI- agar, MH- agar, Columbi blood agar. Tested microorganisms are: E. faecalis, S. aureus, bacterium of Prevotella spp. We found out through the standard agar diffusion method with disks that I2/KI has biggest bactericidal effect except for two cases when Cresophene is present. Using the method with wells we studied the antimicrobial effect only for Cupral and Са(ОН)2- high dispersion. These agents have almost the same antimicrobial activity except for two cases when Cupral has bigger antimicrobial activity. Key words: endodontics microbiology, agar diffusion method.